Errors often occur when the user enter incorrect values into a cell of an Excel spreasheet . For example, an error occurs when instruct the computer to divide a number by zero. Fortunately, we can write Excel 2010 VBA macro to handle those errors efficiently. 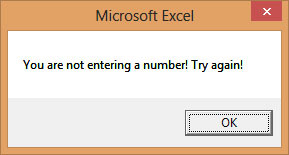 Another example is the user might enter a text (string) to a box that is designed to handle only numeric values, the computer will not be able to perform an arithmetic calculation for text, therefore, will create an error. These errors are known as synchronous errors. Writing errors handling code should be considered a good practice for Excel 2010 VBA programmers, so do not try to finish a program fast by omitting the errors handling code. However, there should not be too many errors handling code in the program as it creates problems for the programmer to maintain and troubleshoot the program later. where program_label is the section of code that is designed by the programmer to handle the error committed by the user. Once an error is detected, the program will jump to the program_label section for error handling. You also need to add the statement Exit Sub to prevent the program from jumping to error handling section even though the inputs were correct. 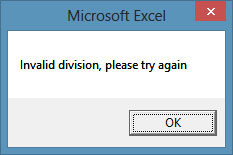 MsgBox "Invalid division, please try again"
MsgBox " Error!You attempt to divide a number by zero!Try again!" MsgBox " You are not entering a number! Try again!" Finally, you can use the keyword Resume Next to prevent error message from appearing and branch back to the section of the program where error occured.